This is a special bonus week--two updates instead of one! Woo hoo! Today we have this drawing, which is a collaboration between me and Mr. D.F. French. Two years ago, in March of 2012, D.F. and I got together on his birthday to draw a comic. We drew a Fuzzball & Scuzzball story called The Bored Lord's Sword. Later I scanned it and put it online, and then I added more strips, and eventually we got here, to strip #216. In March 2013 D.F. and I decided we wanted to draw a comic for our kids, and we drew M.A.R.s, Monsters Against Robots, which I also scanned and put online. Check it out, it's cute. This year we got together and D.F.F. was tired or sick--I don't remember exactly--and was not up to drawing a whole comic. So we decided to collaborate on a drawing instead. D.F. did the layout, figuring out where each character would stand. 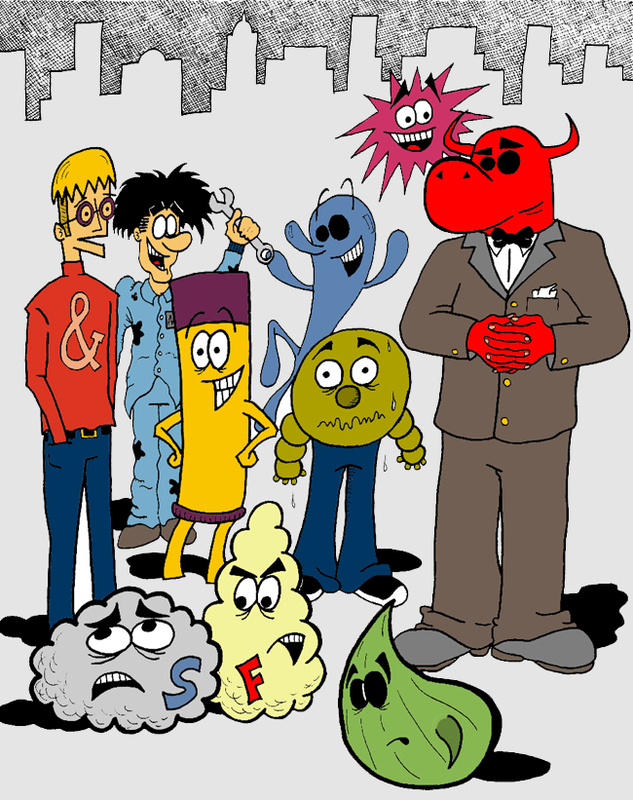 He penciled five of the characters (Fuzzball, Weirdo-Freak, Creature the Creature, Malev'lynn, and Drip Drop Man) and I penciled the other five. Later I inked and colored the whole thing. This is our classic Happy City group of characters. All of them were created in the 1980's, with the exception of Jimmy, who didn't come along until the early 2000's. Malev’lynn made his first appearance in this comic strip back in the black and white days, when he showed up at Fuzzball's dinner party. Here is Max's life story in just two panels. You can learn everything you need to know about Weirdo-Freak's personality here, and everything you need to know about Jimmy's background here. Chappy's finest moment is probably here. Poor Drip Drop Man has previously only appeared in one panel, and he doesn't even have any lines of dialogue. I just don't know what to do with Drip Drop Man. Space Blot had a dramatic introduction here. And finally, Creature was recently introduced into the comic strip here. Check back on Thursday, for an all-new comic strip featuring two of the above characters.